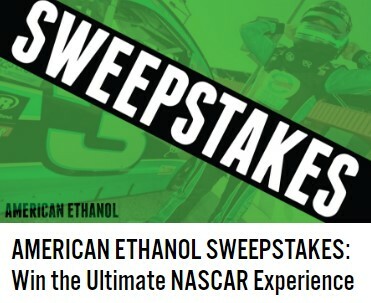 American Ethanol is offering you a chance to enter to win a trip to the 2016 Chase for the NASCAR Sprint Cup race and a meet and greet with # 3 American Ethanol Chevrolet driver Austin Dillon! Prizes: One (1) Grand Prize winner and a guest will receive an all-expense paid trip to attend a Chase for the NASCAR Sprint CupTM race in October (travel dates and times to be determined). The winner will receive the title Ultimate Fan for the No. 3 team for Richard Childress Racing. The winner and his/her guest will receive special VIP access at the track as well as an opportunity to meet Austin Dillon. The guest accompanying the winner must also be 18 years of age or older. The estimated value of package is $4,000.00 and will include round-trip coach airfare, lodging, meals, and ground transportation to and from the track. HINT: You'll want to scroll down a little bit to find the picture above to click on in order to enter the sweepstakes.